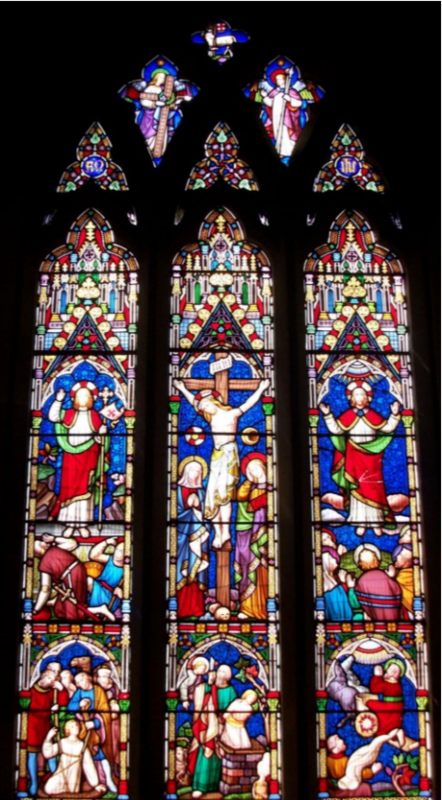 Stained glass windows have adorned churches for many hundreds of years. They have added beauty and splendour and spoken about a God ‘who is light and in whom there is no darkness at all. The colours of the windows change as the light of the day changes. The windows were important teaching aids for the faithful. Their symbolism led people into the stories of the faith and helped them deepen and grow in their own faith. This has certainly been the experience of people at All Saints through the generations. 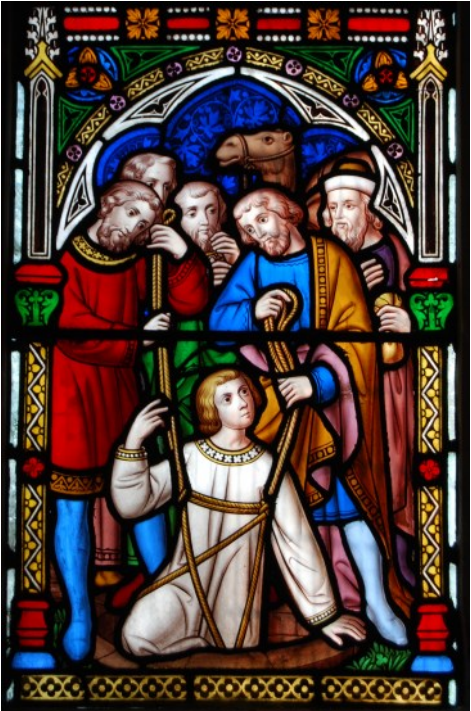 The bottom panels from the left are Joseph’s brother pulling him out of the cistern ready to sell him into slavery; Abraham, in obedience, being prepared to sacrifice his son; and Elijah being assumed into heaven. No wonder Messrs. Ferguson and Urie placed the picture of Joseph and his brothers under the larger picture of Jesus at His Resurrection. Look for a moment at the left hand main picture. He is Risen! The soldier guards fall back in amazement hiding their eyes, the rocks split apart. He is out of the tomb, the black hole in the rocks. That which was intended to be his end becomes His new beginning. We, the sinful of the world intended him harm, but God the Almighty intended good. Joseph was pulled out of the dark cistern in which he was supposed to die – but God had other plans. So with Jesus – laid in a cold dark tomb – He rises at God’s command to bring peace and love and joy for all who meet Him. Often we end up in the caves, tombs, cisterns, cupboards and cellars of our minds. We even come to Church enclosed in our cellars of hurt and depression, of anger and jealousy. Often we come letting everybody know all about our darknesses! Well I do! And yet however we intend – God can intend otherwise – and does so. So the camel in the left hand window, simply a minor part of the whole picture personifies for me just what God can do. And just what God is doing even now amongst us. The great miracle of dark places; caverns, cisterns, cellars, black room or even a tomb, is that the Lord can and does shine in each of them. And for us this is revealed as we reach out to take to ourselves His body and blood in the bread and the wine. Our hands reach outwards to receive the bread, and light shines in our darkness. His wonderful purpose is always for our good, for our light and for our peace. The West Window is the Christian’s response to the message of the East Window. It depict the parable of the Sheep and the Goats in Matthew. Each panel depicts one of the corporal acts of mercy. The window reminds us of Jesus words that reminds us that “whatever you do for the least of these my brethren, you do it to me.” The east and west windows are a wonderful foil for each other. As Jesus gave himself for us out of love and showed us the immensity of God’s love, the west window shows us that the Christian response to that love should be and how we should aim to recognise Jesus in every person we see. The windows in All Saints remain a challenge to everyone who enters the building. We can see them as works of art – and they are. But they continue to teach and remind us of the foundations of our faith. 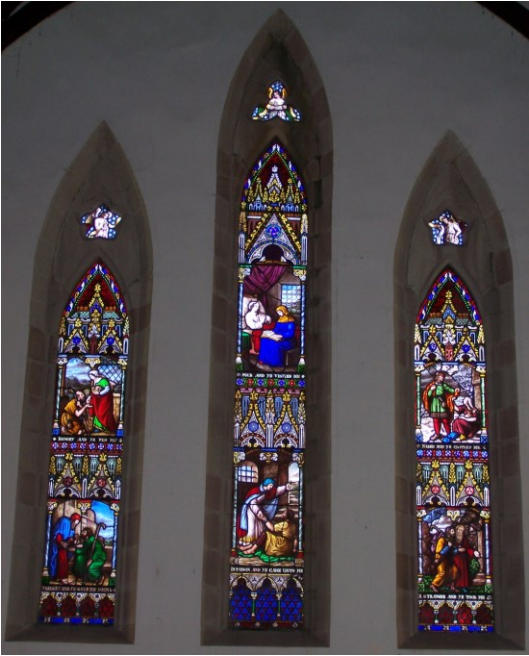 The Conservation Management Plan for the Parish Church of All Saints which was delivered to the Parish in 2008 highlighted the stained glass windows as being of high importance and heritage significance. The glass in All Saints Church was made by three firms – Charles Edmund Clutterbuck, from Stratford, England, Percy Bacon Brothers of London and Ferguson & Urie Co. of Melbourne in the case of the remainder. All the glass is in varying states of deterioration caused naturally by the passage of time and lack of maintenance. Advice tells us that they were seriously under fired originally. Much of the restoration work will involve the replacement of the lead support, which has sagged over many years, and if left unattended will harm or break the actual stained glass. The estimate for the restoration of the windows is $158,500. Stonework around the windows will also have to be restored while the windows are out. Vigorous fund raising is being undertaken to support the donations from parishioners and members of the wider community to match the Government grant. Tax deductible gifts can be made through the National Trust. Please visit the Restoration page for more information about the appeal or to get a donation form. The Your Community Heritage grant has been obtained as a result of energetic representation on our behalf to the federal minister by the local federal Member for Denison, Andrew Wilkie. The people of the parish acknowledge Mr Wilkie’s efforts on our behalf and offer our gratitude for his time and interest in our work. We look forward to being able to show the fruits of the work made possible by the grant.